1. Board sketchy local bus bound for some town no one has ever heard of. 2. Put on your “cool-headed traveler” face. Do not remove this face, especially not when one of the bus’s rear tires explodes under you. Blown tires on desert roads miles from help in any direction are no big thing. Hell, it’s not even really worth slowing down the bus for. Three tires is more than enough for a 6-hour drive. 3. On arrival in small town, befriend some boisterous, middle-aged British men who seem to know what they’re doing. They will guide you to an even sketchier local bus about 1/4 the size of your previous one. Take this bus to the outskirts of Luxor. 4. After getting stopped at a police checkpoint outside of Luxor, disembark and find a Luxor city bus STAT, before the police notice what you and your sketchy foreign selves are doing. 5. Take this bus to a train that is sketchier than all three busses and your behavior put together. If your train resembles something from Joss Whedon’s dystopian future and features some penniless bedouins, you have the right one. On the bright side, it’s only about $2 to get to Aswan this way. On the less bright side, the windows don’t shut and it is now night. Hope you brought your pashmina. 6. In Aswan, locate the official youth hostel. It will be closed at this hour, but you’ll orient yourself to the city a bit in the process. 7. Pull out your Lonely Planet Guide and stand in the middle of the street searching through it for alternative lodging suggestions. Do not accept any offers of nearby young men to take you to their cousin’s hotel. 8. Wander through the city looking for the Nubian Oasis, ignoring pushy late-night street vendors until one of them randomly turns out to be helpful. He will direct you to a dark alleyway which is not a kidnapping setup but rather a surprisingly decent budget hotel with free breakfast. Don’t worry, they still accept walk-ins at 1:30 am. 9. Book your room. Tell the night clerk you’ll pay in the morning. 10. In the morning, sleep through the free breakfast but do pay for your room. Accept the day clerk’s sales pitch of a guided tour to Abu Simbel at 4:00 the next morning, combined with a felucca ride back to Luxor. 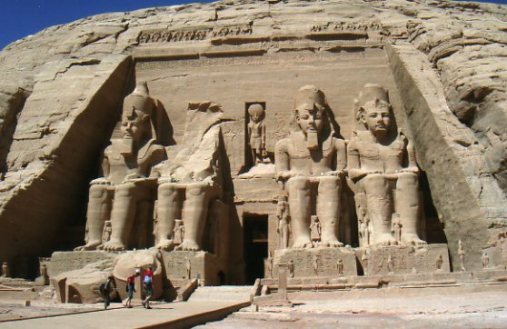 You should do this because the only way to get to Abu Simbel is by booking a seat in a police convoy that leaves at 4am so that, at the end of the 3-hour drive, it is still cool enough to enjoy the ancient temples. 11. Enjoy your day in Aswan. Do not buy spices from the vendors–they will try to marry you. 40 camels may sound like a lot now, but just think how you’ll feel about still being in Aswan in a year. It’s just not worth it unless you REALLY love cardamom. And camels. 12. Visit Elephantine Island. Triple-check that your ferry is actually going to Elephantine Island. If it still goes somewhere else, don’t pay them until they take you where you want to go. 13. On Elephantine Island, don’t pet the baby goats. Yes, they’re cute and furry and probably cleaner than the stray cats in Cairo, but they have to have a mom somewhere and she might not like you. Follow the sheep. They will lead you to a charming cafe/gift shop overlooking the Nile. Drink some hibiscus tea and watch the sun set. 14. After tea, locate the fancy hotel just north of you. The trick is to approach the armed guard at the gate with confidence. When he asks if you are guests at the hotel, say “no” in a tone that implies that this should in no way be a barrier to him letting you in. It will work. Cross the hotel lobby and go down to the free ferry which will take you back to the east bank, where Aswan proper lies. 15. Sit in another cafe with a Stella, watching the rest of the sunset. Chat up a cool Nubian surfing instructor who will then take you and your party out on his friend’s felucca for a mostly-legal (and, more importantly, free) night cruise, Chipseys included. Don’t give him your number. 17. No matter how early you turn in, it won’t seem very early in retrospect at 3:00 the next morning as you groan your way out of bed to take in the free breakfast before boarding a mohair-upholstered van. Prepare for possibly the bumpiest, swerviest ride ever. Those desert roads get mean cross winds. 18. Don’t worry about the police. They are there for your protection. As such, they have the divine right to show up an hour after all the tourists have packed themselves into the vans. 19. DO NOT buy food at the temples. There appears to be a 500% markup for snacks at tourist sites. DO use your student ID from the college you graduated from two years ago to get a 50% student discount into the temple site. Breathe a silent thanks to HU for not putting dates on their ID cards. 20. Enter the temple site. Be amazed. Realize that it actually was worth all the bother.